Roads are important in history. Cultures become portable and ideas are exchanged across vast distances when good roads are available. Major trading routes were the interstate highways of antiquity. You might remember learning about the “Silk Road” in school. Your class might even have spent a couple of days discussing how important it was for China to get their expensive and highly prized silk fabrics all the way to Rome. (Like getting the latest iPhone shipped to the Apple Stores on time.) But have you heard of the Persian Royal Road that predates the better known Silk Road? Even though there’s no road to Dodrazeb, a third-century invading Persian warrior becomes obsessed with the strange isolated kingdom that possesses incredible technology, including methods for communicating over vast distances that are familiar in modern times. Ancient Dodrazeb’s puzzling choice to hide from the world pulls him deeper into layers of mysteries as its sly princess does everything she can to expel the invaders. What are the Dodrazebbians so desperate to keep hidden? The Chinese began making silk fabrics around the year 2700 BCE. Reserved exclusively for use in their imperial court, methods for creating silk were kept secret for more than 3,000 years. But silks showed up in other parts of the world as the Chinese traded it extensively with their nearest neighbors and used it as diplomatic gifts. Early in the first century BCE, silk became prized in the Roman Empire as a rare and exotic luxury. Trading routes were developed and expanded to move the goods from East to West. From Rome, the desire for silk was introduced to other western cultures. The silk trade was important in moving people and products back and forth across Asia, but it wasn’t the only product in demand. Textiles, spices, grain, fruits and vegetables, furs, tools, religious objects, art, precious stones, and much more made the network of Silk Roads well-travelled through the Middle Ages and into the 19th century. Merchants and traders could choose from different routes that crossed Eastern Europe, the Middle East, Central Asia and the Far East. There were also maritime routes which shipped goods from China and South East Asia through the Indian Ocean to Africa, India, and the Near East. Much more was exchanged along the Silk Roads than just sought after trade goods. The trade routes connected major cities and civilizations, making cultural interaction necessary. Languages and customs were understood and adopted to make buying and selling possible. Religions and cultures developed and influenced each other because knowledge about science, arts, literature, crafts, and technologies was shared across the Silk Roads. By the way, scientists and historians now widely believe that the route was a primary way that the Black Death plague bacteria moved westward into Europe. Before the network of Silk Road trading routes, there was the Persian Royal Road which would become one of the main arteries of the Silk Road. Before his death circa 529 BCE, Cyrus the Great had conquered a vast amount of territory, uniting many small and large kingdoms and peoples under his rule. His Achaemenian Empire survived for more than two centuries due to his willingness to support local customs and religions of the people he conquered. When Darius the Great (521-485 BC) rose to power, he realized the Empire needed efficient organization. To prevent his territorial governors from gaining enough power to overthrow him, Darius appointed a separate military commander for each territory. Darius monitored his governors and commanders by using imperial spies. These “king’s ears” kept tabs on both and reported back to Darius through the postal service. The Empire was connected by a network of Royal Roads with stations spaced a day’s travel apart. Like the Silk Road that came later, these routes promoted cultural interaction, uniting disparate peoples in the far-flung Persian Empire. The Persian Royal Road ran from Susa, in north Persia (modern Iran) to the Mediterranean Sea in Asia Minor (modern Turkey) a distance of more than 1,600 miles. The postal stations at regular intervals along the route provided fresh horses for envoys to quickly deliver messages throughout the empire and inspired the famous line “Neither snow nor rain nor heat nor gloom of night stays these couriers from the swift completion of their appointed rounds.” (see my post Ancient Persia’s Pony Express) Relay messengers could traverse the entire road in a mere nine days, sometimes only seven or eight. Normal travel time for caravans or casual travelers was about three months. The Persian Royal Road was so impressive that Alexander the Great used it in his invasion and conquest of the Persian empire in 334 BCE. Never underestimate the importance of good roads—and how they can be used. Not long after ancient people discovered writing, they also discovered the need to store all those handy written records. Whatever form the writing took—clay tablets, papyrus scrolls, parchment books—if it was thought to be important, they were collected and kept for future reference. Libraries exist to collect, organize, store, and sometimes share knowledge. Through the ages, there have been many reasons to establish libraries: the quest for knowledge, the control of information, the pleasure of reading, or the desire to do public good are just a few. While some libraries flourished in ancient times, others were accidentally destroyed or became the victims of libricide—the deliberate burning of books. 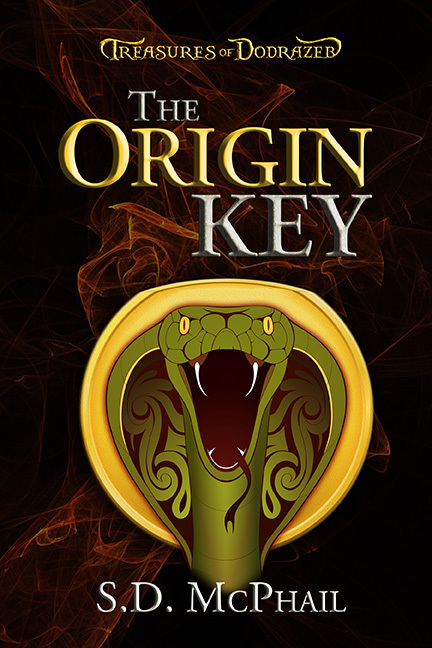 Treasures of Dodrazeb: The Origin Key is a historical sword-and-science fantasy adventure set in the third century. Older and more mysterious than ancient Egypt, the strange kingdom of Dodrazeb ignites a Persian warrior’s curiosity when he leads an army to conquer it. Mesmerized by Dodrazeb’s puzzles, the warrior is determined to peel back its layers of secrets as a desperate princess does everything she can to expel the invaders. What have they been hiding for thousands of years? Get your copy on Amazon.com! Available in both e-book and paperback. The oldest known libraries consisted of clay tablets in cuneiform script discovered in temple rooms in Sumer, some dating back to 2600 BCE. These archives, which mainly consisted of the records of commercial transactions or inventories, mark the end of prehistory and the start of history. Over 30,000 clay tablets from the Library of Ashurbanipal have been discovered at Nineveh providing modern scholars with an amazing wealth of Mesopotamian literary, religious, and administrative work dating from the seventh century BCE. Among the findings were astronomic/astrological texts, as well as standard lists used by scribes and scholars such as word lists, bilingual vocabularies, lists of signs and synonyms, and lists of medical diagnoses. One of the most famous of all ancient libraries is the one constructed in Alexandria, Egypt. Legend says that Alexander the Great was inspired to build a library to contain all the works of the nations he conquered and have them translated into Greek. Alexander didn’t live to see it built, but his successor Ptolemy I began building it about 306 BCE. A prototype of the modern research university, this library was established to focus on research and become an academy for scholars. It attracted scholars by offering free room, board, servants, and salaries. This changed when Alexandria came under the rule of Roman emperors who restricted intellectual freedom. With rooms for acquisitions and cataloguing, the library held between 400,000 and 700,000 scrolls including works from Assyria, Greece, Persia, Egypt, India, and many other nations. The library acquired high quality items including the best, most authoritative original works. Any works not written in Greek were translated. The library took its mission to obtain a copy of every book ever written very seriously, and employed some rather unethical tactics to make it happen. Acquisitions of materials were made three ways: stealing and confiscation, borrowing and copying (with the library keeping the original and returning a copy), and purchasing. Even though some items were purchased from booksellers, the library often forced the sale of books in exchange for food rather than currency. A casualty of wars, riots, and social upheavals over several centuries, the magnificent library at Alexandria suffered the same fate as many other libraries throughout history. Its destruction has become a symbol for the loss of cultural knowledge. What a tragedy!